Red birthmarks are made up of blood vessels close to the skin surface. These are called vascular birthmarks. Pigmented birthmarks are areas in which the color of the birthmark is different from the color of the rest of the skin. A hemangioma is an abnormal buildup of blood vessels in the skin or internal organs. Strawberry hemangiomas (strawberry mark, nevus vascularis, capillary hemangioma, hemangioma simplex) may develop several weeks after birth. They may appear anywhere on the body, but are most often found on the neck and face. These areas consist of small blood vessels that are very close together. Cavernous hemangiomas (angioma cavernosum, cavernoma) are similar to strawberry hemangiomas but they are deeper and may appear as a red-blue spongy area of tissue filled with blood. Salmon patches (stork bites) are very common. Up to half of all newborns have them. They are small, pink, flat spots made up of small blood vessels that can be seen through the skin. They are most common on the forehead, eyelids, upper lip, between the eyebrows, and on the back of the neck. Salmon patches may be more noticeable when an infant cries or during temperature changes. Port-wine stains are flat hemangiomas made of expanded tiny blood vessels (capillaries). Port-wine stains on the face may be associated with Sturge-Weber syndrome. They are most often located on the face. Their size varies from very small to over half of the body's surface. A port-wine stain is a birthmark in which swollen blood vessels create a reddish-purplish discoloration of the skin. A health care provider should examine all birthmarks. Diagnosis is based on how the birthmark looks. Many strawberry hemangiomas, cavernous hemangiomas, and salmon patches are temporary and do not need treatment. Most permanent birthmarks are not treated before a child reaches school age or the birthmark is causing symptoms. Port-wine stains on the face are an exception. They should be treated at a young age to prevent emotional and social problems. Laser surgery can be used to treat them. Concealing cosmetics may hide permanent birthmarks. Oral or injected cortisone may reduce the size of a hemangioma that is growing quickly and affecting vision or vital organs. Strawberry hemangiomas usually grow quickly and stay the same size. Then they go away. Most strawberry hemangiomas are gone by the time a child is 9 years old. 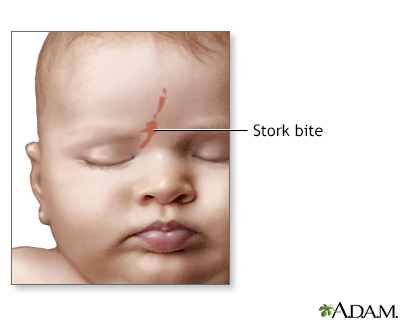 However, there may be a slight change in color or puckering of the skin where the birthmark was. Some cavernous hemangiomas go away on their own, usually as a child is about school age. Salmon patches often fade as the infant grows. Patches on the back of the neck may not fade. They usually are not visible as hair grows. Port-wine stains are often permanent. Have your health care provider look at all birthmarks. There is no known way to prevent birthmarks. Paller AS, Mancini AJ. Vascular disorders of infancy and childhood. In: Paller AS, Mancini AJ, eds. Hurwitz Clinical Pediatric Dermatology. 5th ed. Philadelphia, PA: Elsevier; 2016:chap 12. Hemangiomas are tumors made up of dilated blood vessels that usually appear shortly after birth, although they may be present at birth. 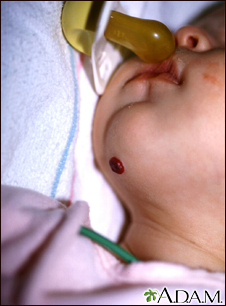 Hemangiomas on the face can be disfiguring and may interfere with visual development or cause obstruction of the airway.